CLEMSON, SC – Thousands of Tiger fans are expected to descend on Historic Riggs Field this Friday at 7:30 p.m. when the men’s soccer team plays host to Wake Forest. The game is part of Clemson University’s annual First Friday celebration. Friday’s festivities kick off with the annual First Friday Parade at 6:00 p.m. This year’s theme is “Time Honored Traditions.” The parade will start in front of the President’s House at the intersection of Cherry Road and S.C. 93 and proceed up 93 toward downtown. It will end at Historic Riggs Field where a pep rally, featuring the Tiger Band, cheerleaders and Rally Cats, will commence before the game. The parade float winners, as well as Miss First Friday, will be announced at halftime. This year’s Grand Marshal is head women’s basketball coach Itoro Coleman. 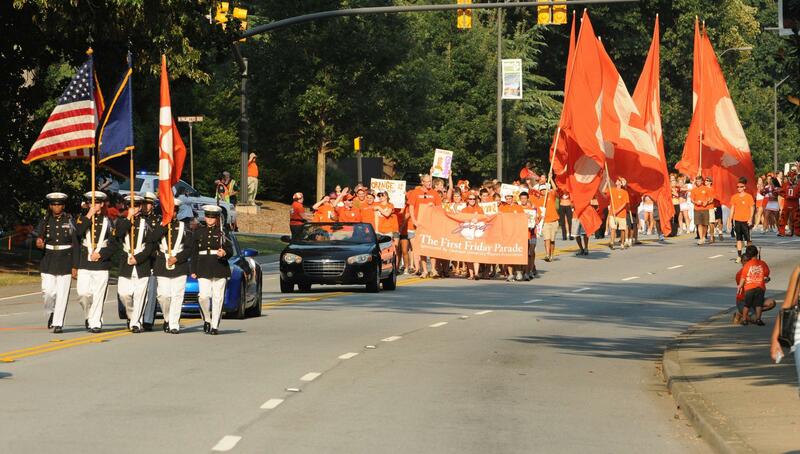 Immediately following the pep rally, Clemson University will dedicate I.M. Ibrahim Stadium in a ceremony that honors the legendary coach. Often called the “Father of Clemson Soccer,” Ibrahim created a lasting legacy as head coach of the men’s soccer team, leading the team to two national championships and eleven ACC titles. The ceremony will include the Ibrahim family, as well as many Clemson soccer alumni. At 7:30 p.m. the team will kick off the game against the Demon Deacons in front of what they hope will be a record crowd. Last year’s attendance of nearly 7,500 was the largest on record for a regular season game at Historic Riggs Field. The Tigers are hoping to again break that record. Admission to the parade, pep rally and men’s soccer game is free. Fans are encouraged to show their Tiger Pride by wearing orange.